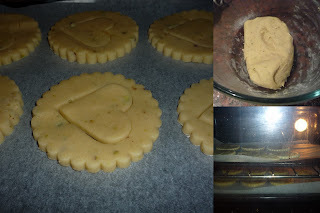 Jagruti's Cooking Odyssey: ♥ Love at first sight or Love at first Bite ;) Melt in Mouth Pistachio Shortbread ! ! ! 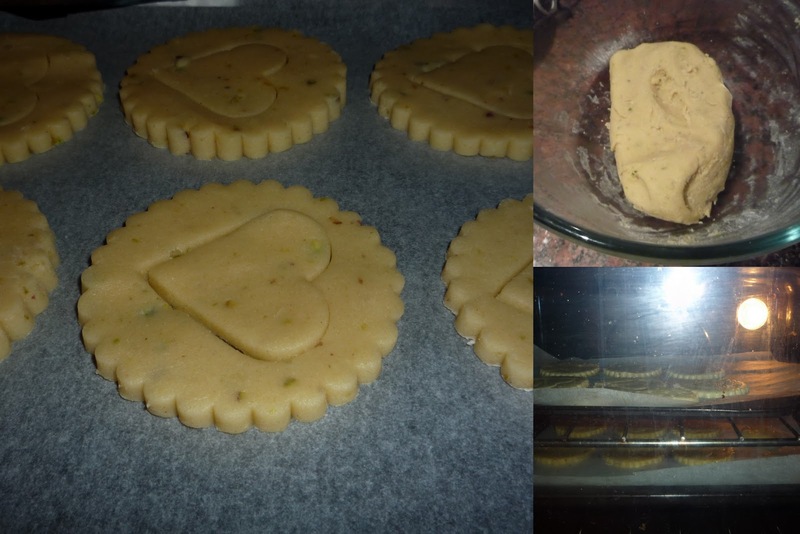 ♥ Love at first sight or Love at first Bite ;) Melt in Mouth Pistachio Shortbread ! ! ! "One cannot﻿ fall in love...it happens"
Love is a precious gift or feeling given by GOD to every living creature on this earth, and only God knows that where, when and how we will give and get this love ...Love is an universal language, that everyone knows , speaks and feels at least once in a lifetime....People say Love is Blind..Love does not see any cast, colour or religion...to feel this wonderful feeling you have to give your love to someone....! 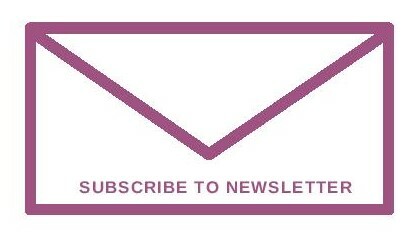 Enjoy A Byte of Soul Food! -- To give you a boost on Monday Morning! The Greek language has various words for love. One of them is agape, meaning love without expecting anything in return. This is not selfish or self-serving love—it is selfless and unconditional. But is it possible? How can we not feel slighted when we don't receive the treatment we want or feel we deserve in return for some good deed? How can we not "keep score," or not desire recompense or at least a response? God can love like that, and He can give us love like that for others. In his book Dream a New Dream Dale Galloway tells about a little boy who wanted to celebrate Valentine's Day—a holiday when cards or gifts are exchanged as tokens of love and friendship. Little Chad was a shy, quiet young fellow. One day he came home and told his mother he'd like to make a Valentine's Day card for everyone in his class. Her heart sank. She thought, I wish he wouldn't do that! She had watched the children when they walked home from school, and her Chad was always behind them. They laughed and hung on to each other and talked to each other, but Chad was never included. Nevertheless, she decided she would go along with her son, so she purchased the paper and glue and crayons. For three whole weeks, night after night, Chad painstakingly made thirty-five valentines. Valentine's Day dawned, and Chad was beside himself with excitement! He carefully stacked up his Valentine's Day cards, put them in a bag, and bolted out the door. His mom decided to bake him his favorite cookies and serve them up warm and nice with a cool glass of milk when he came home from school. She just knew he would be disappointed—maybe the snack would ease the pain a little. It hurt her to think that he wouldn't get many valentines himself, and maybe none at all. That afternoon she had the cookies and milk on the table. When she heard the children outside, she looked out the window. Sure enough, here they came, laughing and having the best time. And, as always, there was Chad in the rear. He walked a little faster than usual. She fully expected him to burst into tears as soon as he got inside. His arms were empty, she noticed, and when the door opened she choked back the tears. But he hardly heard her words. He just marched right on by, his face aglow, and all he said was: "Not a one! Not a one!" Her heart sank. Mix all the ingredients in a big bowl until the mixture comes together. Knead lightly, cover with cling film and refrigerate for an hour. Pre-heat the oven to 180C/355F or Gas Mark 4. Knead briefly after removing it from the fridge. Roll flat to about 1/2 " thickness cut the biscuits out Lay out on a non-stick baking mat or baking parchment.Allow some space between them for expansion. Bake until golden brown.Remove from the oven and allow to cool completeley before decorating....Enjoy with a cuppa and your VALENTINE.....! 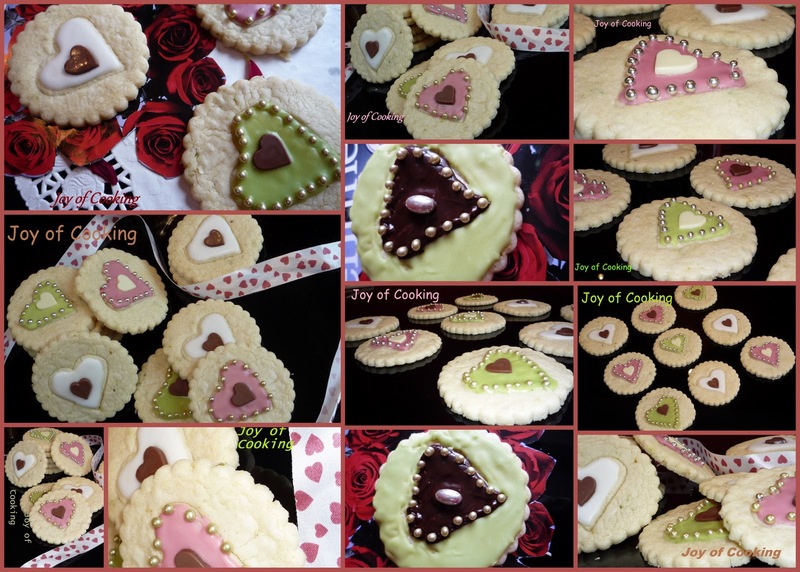 So cute and damn pretty cookies...Happy Valentine's day to u and ur loved ones..
That was one of the cutest and gorgeous cookies I have seen of late, Happy Valentine to u and ur family. Wow, these look mouthwatering and amazing! wow !!! wow !! so cute !!! My son loves pistachios n short bread ! will definitely try it ! thanks so much for sharing this ! Wow the cookies look too good to eat!! Cute looking cookies. Looks awesome. 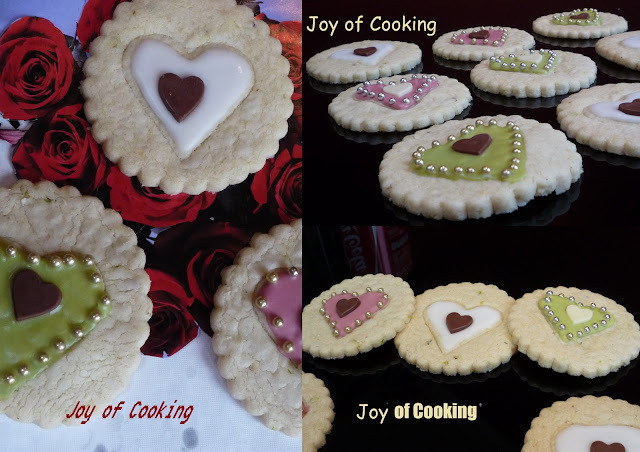 How lovely and happy these cookies look! Love your presentation and the deco on the cookies, Jagriti. Shortbreads are made to most beautiful one...Happy valentine's day.. 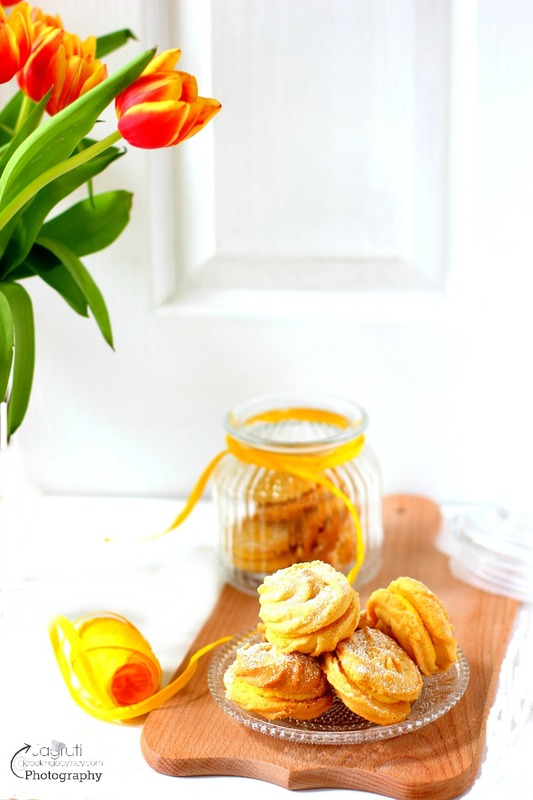 Such a wonderfully written post and so beautiful and festive looking cookies. Happy Valentine's Day. I liked the story of a boy. Yes, we cannot be so selfless.. Its only God who loves us unconditionally. as you have written, we can go on for years on this subject. such interesting colors on the cookies!